Australia has long benefitted from the concept of return seasons of musicals. 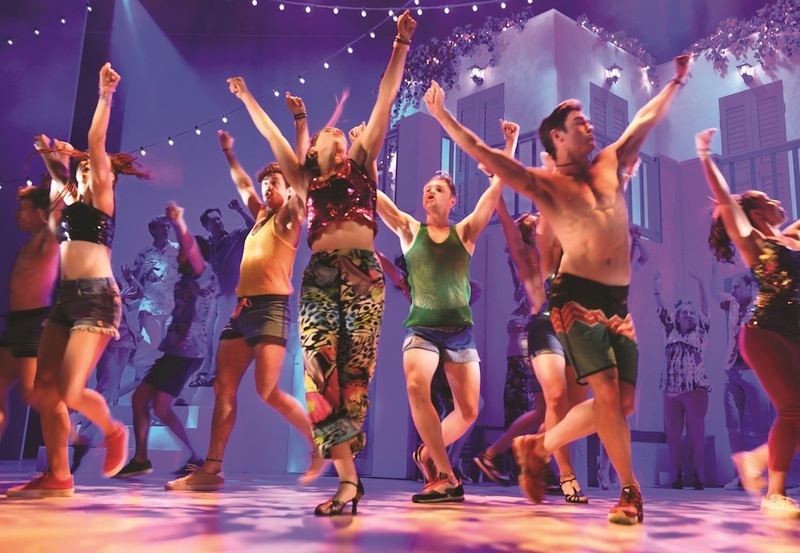 In New York and London, long-running shows wither away as faded tourist attractions, while Australia is blessed by fresh productions with enthusiastic cast and creatives. 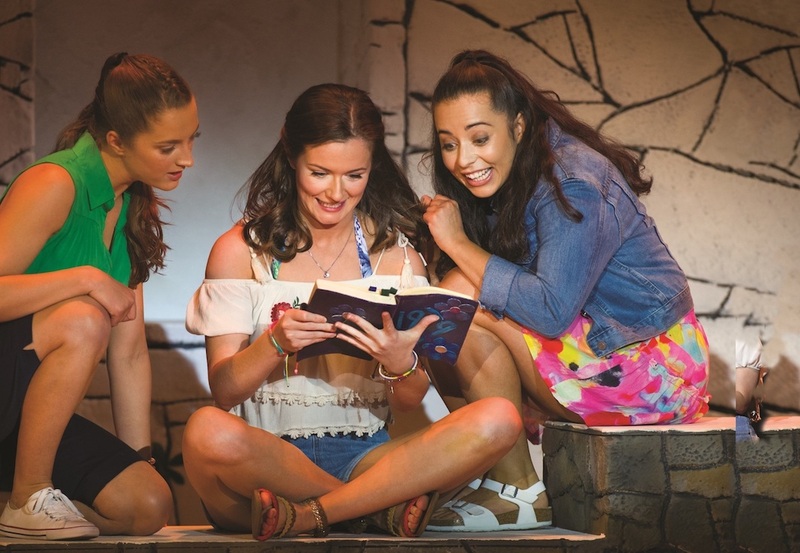 The third Australian tour of Mamma Mia! takes this a step further, replacing the well-worn franchised production with an entirely new staging that originated here. The undoubted stars of the show remain the ever-infectious ABBA songs of Benny Anderson and Björn Ulvaeus, gloriously re-purposed to fit the featherlight concept of Catherine Johnson’s simple but effective book. 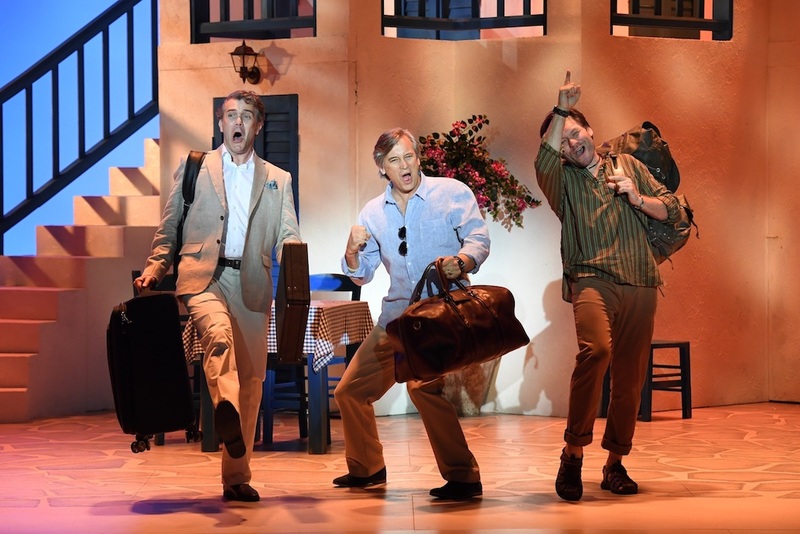 Director Gary Young retains the sky-high energy needed to sell the show, underpinning the heightened theatrics with plenty of warmth and heart. The well-matched cast exudes dynamic verve as they spread musical theatre joy to the far reaches of the auditorium. When crafting a new staging, it helps when one of your three producers is also a highly accomplished set designer. Linda Bewick replaces the original abstract set with a versatile, handsome design that includes a two-story villa (with much needed balcony) and crumbling rock wall. White walls are offset by rich Mediterranean blue trim and lush, realistic foliage to create an attractive stage picture. 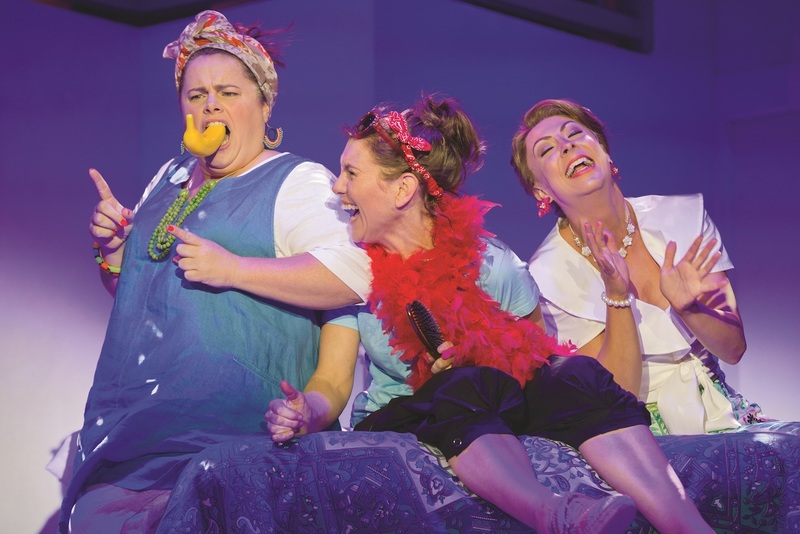 Suzy Strout’s costumes pick up the breezy holiday shades before adding vibrant splashes of colour as the buck’s party and hen’s night ramp up the energy. The retro ABBA homage outfits remain as spectacular, and funny, as ever. In an interesting touch of realism, this is the first musical seen in many a year where there is not a wig in sight. 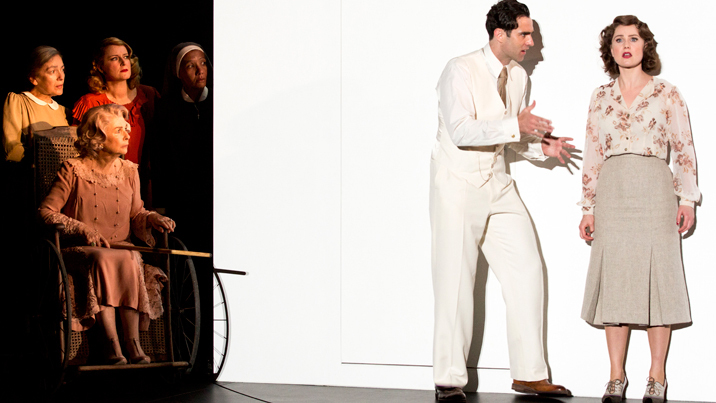 Working closely with Young’s refreshed direction is the terrific choreography of Tom Hodgson. The boys’ flipper dance in “Lay All Your Love on Me” is a highlight, and act two’s “Does Your Mother Know” absolutely brings the house down. Young and Hodgson’s most striking new staging is for act two opener “Under Attack.” In place of fluorescent beachwear under UV lights, Sophie has her own elaborate version of “Tevye’s Dream,” complete with fiancé Sky as Fruma-Sarah. Lighting designer Gavan Swift magically covers the transition back to the villa with dozens of tiny beams of light. 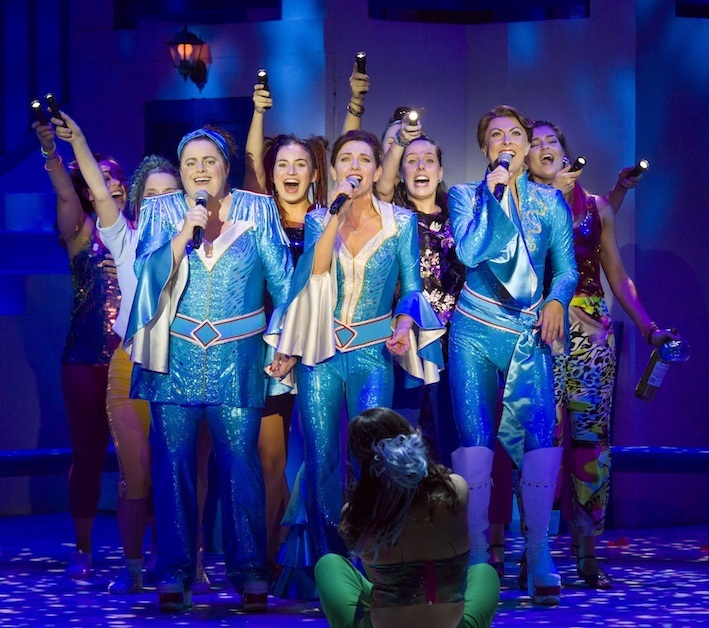 Stephen Amos, musical supervisor of the original Australian tour of Mamma Mia!, returns to recreate that smoothly blended vocal sound. It is clear that the ensemble members are capable of singing more than just “ooh” and “ahh,” but that is largely their lot in this show. While Michael Waters’ sound design is clear and well balanced, the sound is often so processed that there is a distinct lack of character in the vocals, an aspect that even the lead singers are not really able to overcome. 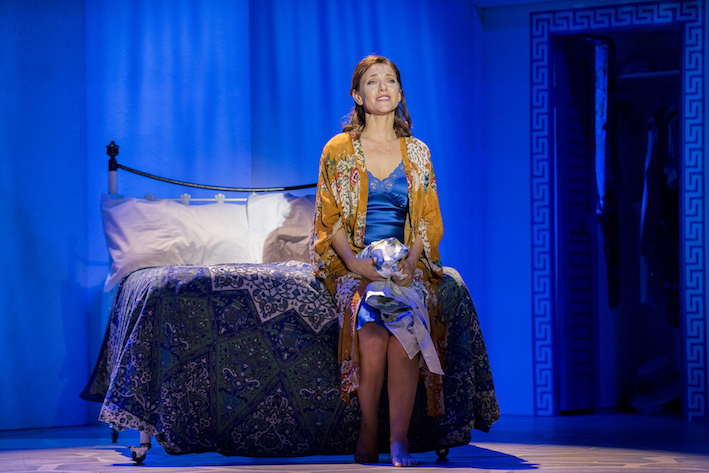 The beating heart of this production is the superb performance of Natalie O’Donnell as Donna Sheridan. While the rest of the cast is in a colourful, energetic fantasy, O’Donnell appears to be actually living and breathing Donna’s story, underpinning the frivolity with high stakes humanity. 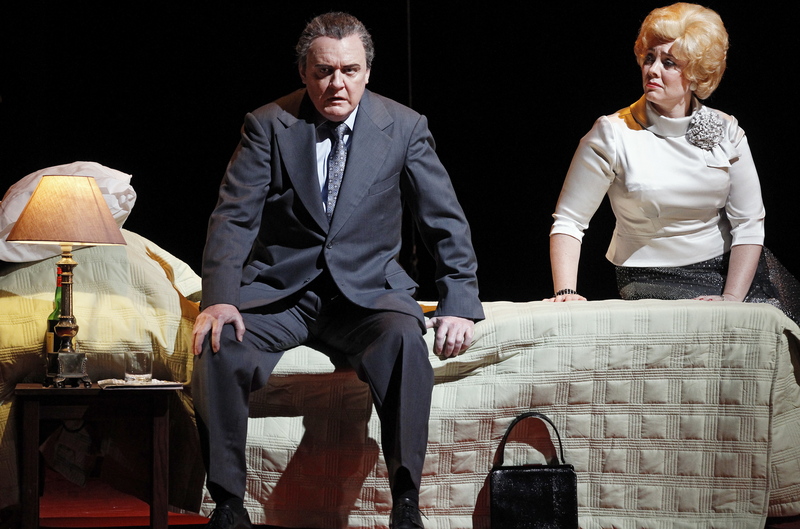 A master at bringing the audience to her, O’Donnell eschews all the usual leading lady conceits to give a natural, highly affecting performance, and the show is all the richer for it. Sarah Morrison grounds frenzied bride Sophie in sincerity, developing lovely chemistry with O’Donnell. The mother and daughter wedding dress scene of “Slipping Through My Fingers” is the most beautiful and touching version seen to date. Ian Stenlake efficiently captures the laidback manner of Sam. In a somewhat odd choice, Sam is basically in darkness while O’Donnell sings her heart out in choice power ballad “The Winner Tales It All,” robbing Stenlake of one of Sam’s key acting scenes. Josef Ber brings a hearty energy to world traveller Bill Austin. Philip Lowe is delightfully amusing as fastidious ex-rocker Harry Bright. Lumbered with a brittle toffy London accent as Sky, Stephen Mahy nonetheless allows the young groom’s down to earth charm to shine through. Sam Hooper gives a breakout performance as perky Pepper, performing some spectacular dance moves. 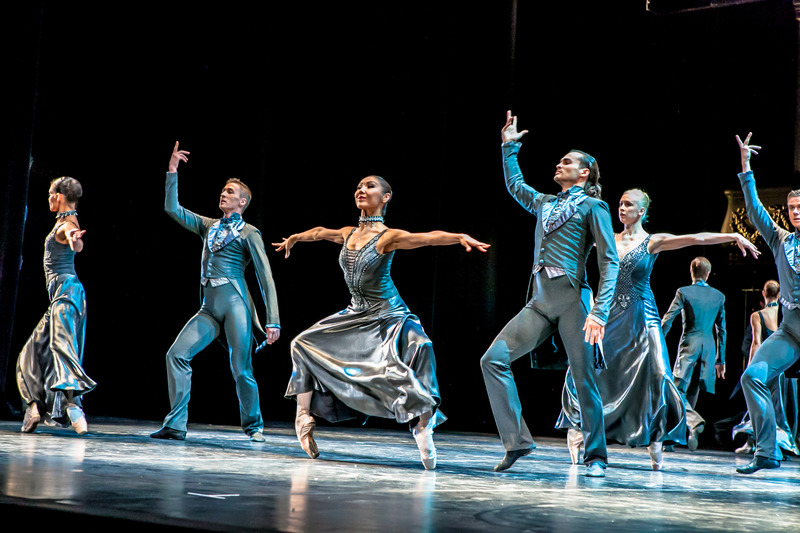 Spending much of their time in the thankless task of off-stage back-up singing, the ensemble expends abundant energy when onstage, especially when performing Hodgson’s exuberant choreography. Mamma Mia! is Melbourne’s theatrical party of the year. Happiness is guaranteed. Mamma Mia! plays at Princess Theatre, Melbourne until 30 September 2018 before touring to Adelaide 9 October – 11 November 2018. Have just seen this in Adelaide Simon and I simply could not get passed the shoddy karaoke infused orchestral overture that was way way too loud and Stephen Mahy’s irritating accent. What possessed the producers to ok this ridiculous characterisation ? I sincerely feel overall that apart from a few moments of dynamic vocals and choreography that this is intrinsically a B grade touring production with B grade phone in performances. Not for me this time around ! Sorry you didn’t enjoy this, Edward. Yes, city banker Sky was a bit of an odd choice. I already felt that the original production wasn’t not much more than a B grade touring production, so I was glad they at least had a go at doing a different staging. Meanwhile, I am still yet to see MM Here We Go Again so at least there is that to look forward to..